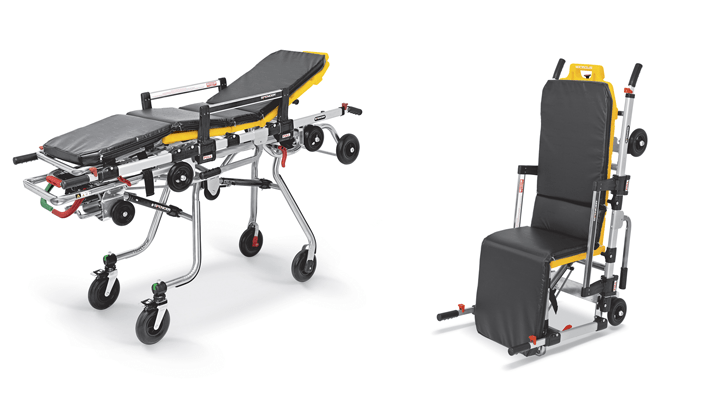 With the most advanced technologies applied on a self-loading stretcher, Spencer Cross Chair is the first device adopting innovative solutions for the transport of patients in rescue operations on the road and in ambulance. This device could be transformed from stretcher to chair in just 2 seconds. When the demand for new cutting-edge devices that can meet the daily needs of rescue meet the talent of Spencer, we can expect a real prodigy of industrial design. Cross Chair is the ideal device to assist rescue professionals, who in their daily activities wish to experience a really new solution to improve emergency road rescue and patient transport in the emergency vehicle. Cross Chair can be used as a stretcher or as a transport chair as it adapts to a wide range of operational scenarios. Two essential devices rolled into one big project. The rescue teams will be able to choose between the two configurations, according to the type of required operational procedure, so that to have a manageable stretcher for the patients or – in alternative – a practical transport chair and without the inconvenience of having to overburden the sanitary compartment of the emergency vehicle. For added versatility and safety, a purpose made trolley is available. The Cross stretcher is supplied with two model STX 702 restraint straps and mattress. Spencer featured a lot of interesting videos about the new Cross Chair and the numerous new devices presented in 2015. We could show you a short demo made during MEDICA Exhibition with this device.